It’s a good idea to invest in a good serum or face oil if you are looking for extra hydration, as generally speaking a moisturiser can only deliver so much – however brilliant it may be. Argan oil is a fantastic ingredient with well-known anti-ageing properties, so it’s ideal to use on your face. 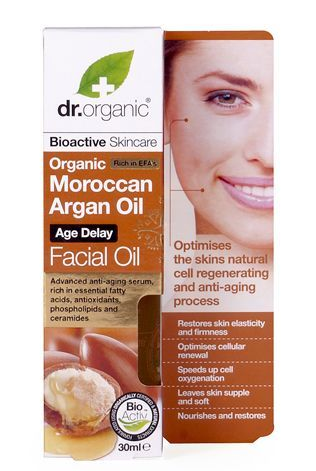 The Moroccan Argan Facial Oil from Dr. Organic is a great non-greasy serum-like oil that you can use daily, before moisturising in the morning and after moisturising in the evening. Apart form its main ingredient, argan oil, it also contains sweet almond oil, vitamin E, jojoba oil and rosehip oil, all of which have bioactive and rejuvenating properties. After using it you will feel you skin instantly moisturised and hydrated (the oil helps to stabilise skin hydration levels) leaving it feeling younger-looking, smoother and softer to the touch. It’s sweet, light and a real indulgence. A great addition to the Dr Organic family. For more information go to www.hollandandbarrett.com, priced at £14.99. This entry was posted in Skincare and tagged Age Delay, Dr Organic, Facial Oil, Moroccan Argan Oil, organic, Pure. Bookmark the permalink.